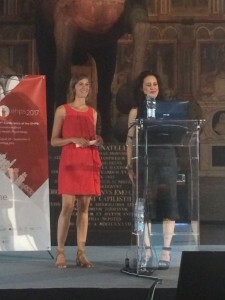 Published on August 31st 2017 – This summer, Dr. Eline Smit received the prestigious Early Career Award from the European Health Psychology Society (EHPS). The EHPS Early Career Award aims to recognize outstanding research excellence, contributions made to the EHPS and/or contributions to professional practice made by EHPS members within 5 years of their PhD. The award was handed to Eline during the opening ceremony of the annual EHPS conference in Padua, Italy.